Fluorite is a fascinating gem that seems to be discovered in a never-ending variety of dynamic colors. Purple fluorite is one such variation and easily finds its home within the pantheon of purple gemstones. Like all members of the fluorite family, certain qualities are universal to this stone. Ranking four on the Mohs scale, fluorite is also the defining mineral for this level. It's a softer material. Despite this, many fine specimens exist and are found across a wide range of fluorite jewelry. Is purple fluorite valuable? The value of colored stones is typically determined by a combination of its color, clarity, cut, and carat weight. This is no different when determining what purple fluorite is worth. These guidelines will help you choose fluorite stones for your collection. Exuding rich wine hues, purple fluorite finds a unique niche among purple gemstones. Purple fluorite is also subject to color zoning, making the process of sorting and matching labor intensive. The results are worthwhile, however, as the vibrancy of the gem’s hue is not often seen in purple jewels, who often display a more saturated and deeper blend of color. In terms of clarity, purple fluorite belongs to the Type II category of the GIA clarity grading system, where most of the gemstones are expected to contain inclusions. But due to their saturated and deep color, most of these gemstones appear eye clean when viewed without magnification. Inclusions are accepted in this colorful gemstone. However, large amount of inclusions decreases the value of the fluorite gemstone. As purple fluorite ranks four on the Mohs scale of hardness, only skilled lapidaries can easily shape the stone. Purple fluorite is commonly found in traditional ovals, rounds and cushions, but fancier shapes can be found. Owing to its softness, fluorite tends to chip, and therefore, gemstones must be cut very carefully. Purple fluorite is occasionally available in pear cut with sizes ranging up to 20mm x 15mm. Other classic cuts, such as rounds, can be found in sizes between 6mm to 14mm, and ovals up to 18mm x 13mm in size. With plentiful resources around the world, the difference in sizes only moderately affects the prices, keeping this gem affordable no matter how big you’d like to go. Like other fluorites, purple fluorite may be exposed to heat treatment or irradiation to improve existing color. The treatment offered has a good stability and is permanent with normal care. Purple fluorite ranks four on the Mohs scale of hardness making it a good choice for occasional wear. While it has a low hardness, this gemstone has good toughness and with proper care fluorite jewelry makes a durable option. As these pieces are worn occasionally, they need proper care and cleaning. Take out time to clean your fluorite jewelry regularly. Use lukewarm water with dish soap to remove dirt with the help of soft brush. Wipe out the wetness with a dry soft cloth to maintain its luster. As this gemstone possesses treatments like heat and irradiation, it is good not to use steam and ultrasonic cleaners. As with any gem, this jewel should be handled carefully to prevent scratching, abrasion or chipping. Like cleaning, the storage of fluorite jewelry should requires good care. 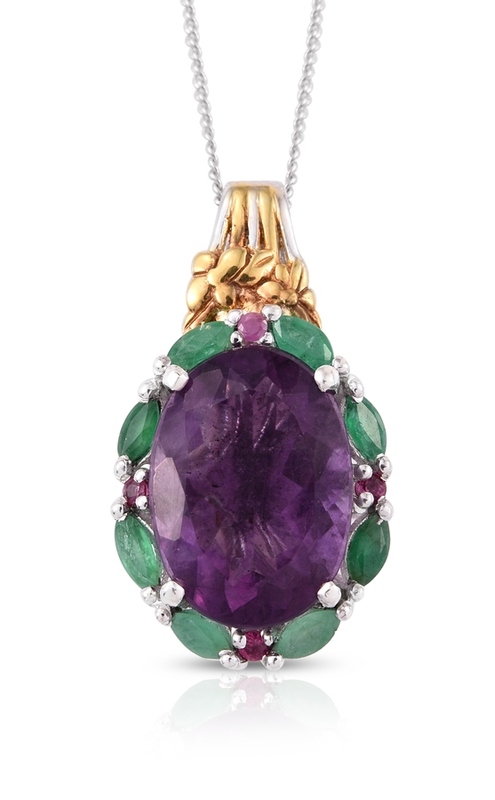 Store your fluorite jewelry in a velvet-lined jewelry box to save from any unwanted damage or chipping. This would also helps precent any chance of your fluorite jewelry getting scratched by other stones. Who Can Wear Purple Fluorite? 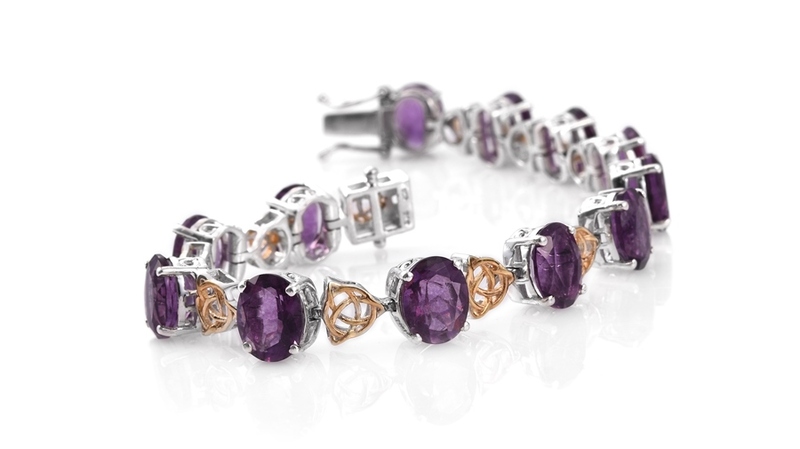 For anyone who loves romantic purple sparkles, purple fluorite is an excellent choice. Due to its low hardness on the Mohs scale, earrings and pendants are the best jewelry styles to choose for daily wear. Rings and bracelets are ideal for occasional wear. This gorgeous stone makes an excellent companion to pastels, shades of yellow, refreshing greens and glamorous black. How Does Purple Fluorite Compare to Other Purple Stones? Lovers of royal purple hues are some of the luckiest collectors around! There are a great variety of purple gemstones from which to choose, which can make the task of choosing a favorite daunting. Purple fluorite is often compared to amethyst in color, and at first glance, it is easy to see why. Both tend towards that balance of color that makes a typical purple. Side-by-side, however, subtle variations and differences can be spotted. 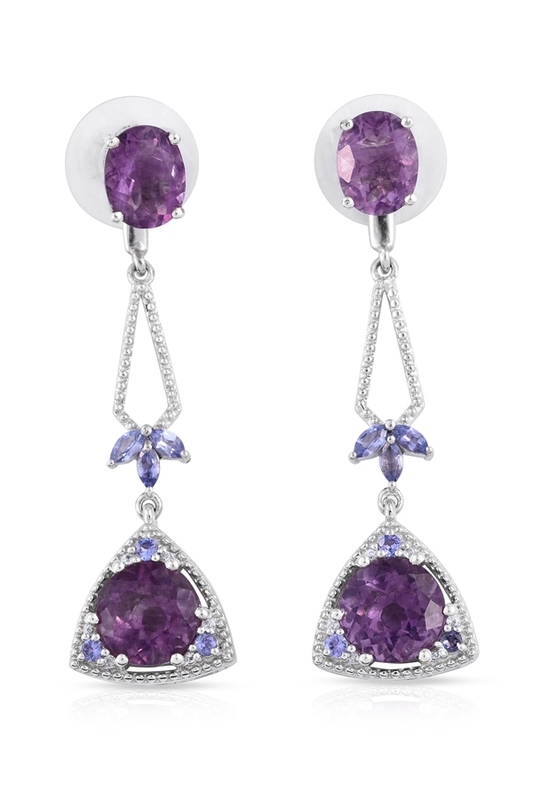 Most amethyst favors blue tinges in their purple coloration, making the gems appear serene and regal. The majority of purple fluorite favors subtle splashes of red, making the gem appear a bit livelier and more energetic. In general, purple fluorite is bridging the gap between amethyst and purple garnet. It occupies the middle ground between the two popular gems, providing a wonderful balance of cool and warm color. Anyone who loves amethyst, purple sapphire, purple garnet or other purple gems will appreciate the captivating glow of purple fluorite. Where Does Purple Fluorite Come From? The mineral version of fluorite exists all over the world. Fluorite gem deposits are located in many of these localities, available in an exciting rainbow of color. Purple fluorite is sourced by Shop LC from the Hunan Province of China. How is Purple Fluorite Mined? Mining in Hunan is a seasonal endeavor. Frigid conditions and the heavy snows of winter limit mining of this gem to the warmer months of spring and summer. In addition, fluorite is a delicate gemstone. For this reason, specialized machinery and techniques are required for extraction. Care must be used when it is dug up from the Earth to prevent damage to the rough. What Does Purple Fluorite Mean? Purple fluorite is believed to strengthen the wearer’s mystical insight as well as psychic awareness. It is also said to dispel negative energy by re-energizing the atmosphere (especially from the environment). It also makes a wonderful crystal when it comes to the mind. If you want to have a strong brainstorming session, or are stuck in writer’s block, or need to have some fresh thoughts, purple fluorite may help. Whether you are studying for exams, occupied in work or want to focus on the job at hand, purple fluorite is an excellent choice. Physically, purple fluorite improves immune system and comforts headaches. It supports bones and teeth, takes care of arthritis and assists in the bone marrow illnesses treatment. Fluorite helps scars heal, both physical as well as emotional. It can also help with ulcers, sore throats, stomach pain and insomnia. Is Purple Fluorite a Birthstone? Purple fluorite is not recognized as a modern birthstone. 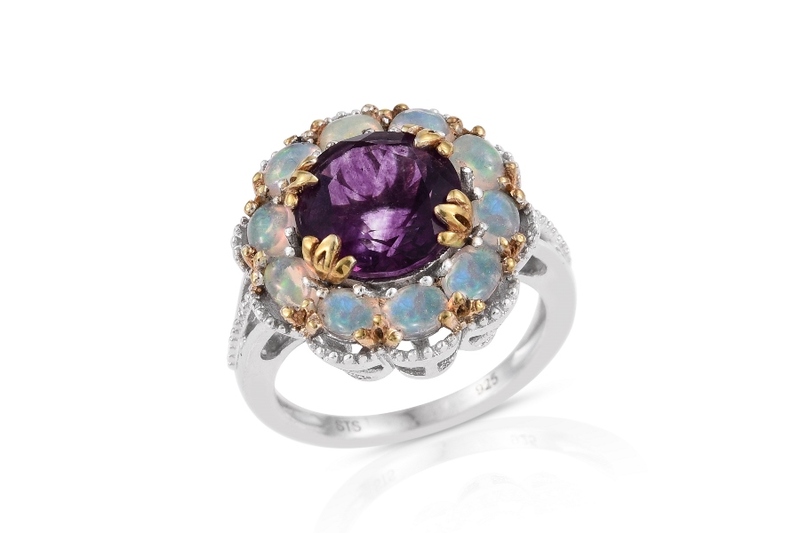 Its saturated purple hue makes this gemstone a viable alternative for the February birthstone, Amethyst. Purple fluorite ranks four on the Mohs scale of hardness. Color presents as purple, with subtle hints of red. Sourced from Hunan Province, China. May be irradiated to improve or create color.